New REV'IT! Leathers: Race to Perfection! It was close to midnight as I crawled out of my tent and stretched out atop a picnic table wearing nothing but a pair of running shorts. Despite the fact that the sun had long since retreated below the horizon, the night had brought with it little relief from the heat of a Texan summer. As I lay there in Tyler Texas State Park, staring at the stars blinking through the branches of the trees overhead, the temperature remained in the mid-nineties, about ten degrees cooler than a few hours before when I was battling Friday afternoon traffic out of Dallas. I was in the midst of a cross-country trek from Los Angeles to just north of Philadelphia to visit my parents in at their new house in Allentown. I had decided to make the trip using my well-worn zip-together Rev-It! RS2, two-piece leather race suit. I have used this jacket and pant combo for everything from track days testing out a fleet of new Triumph street bikes to a 9,000 mile cross country trip exploring America’s oldest Cross Continental road, the Lincoln Highway. As I laid there, dripping with sweat and unable to sleep, I was starting to doubt my genius in making this particular trip while wearing full racing leathers. That particular two-piece Rev’It! suit has served my needs well over the years as I prefer the versatility it provides over a one-piece track suit. I was disappointed to learn that Rev’It! had stopped making stand-alone race pants; That is, until now. Rev’It! 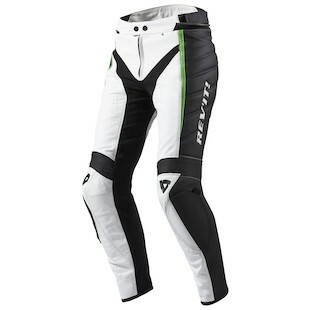 has announced two new pairs of stand alone leather race pants available in early 2014, just in time for the spring riding season here in the US. Like other Rev’It! offerings, the REV'IT! GT-R Pants, or Leather Trousers, for men and the Xena Ladies Leather Trousers for women will be available in three different lengths making it easy to achieve a perfectly tailored fit without having to deal with any alterations in the process. The GT-R pants will couple with the REV'IT! 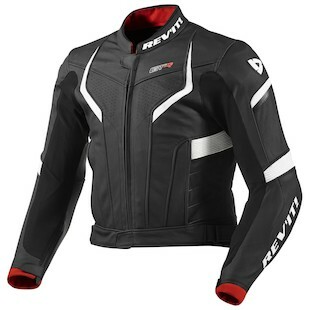 GT-R Jacket, as well as the Stellar and Galactic leather jackets, which Rev’It! introduced last year, via a 270 degree waist zipper. The jackets and pants will be sharing the same Monaco Performance cowhide leather construction. The GT-R pants will come with height adjustable Prolife CE rated comfort armor in the knees, Tryonic Seesoft CE-Level 1 protective inserts at the hips, and a set of dual compound knee sliders. Not one to leave the ladies of our sport unprotected, the REV'IT! Xena Pants will cater to the feminine form matching up with the existing Xena and Galactic Jackets. While the Xenas will share the same Monaco Performance leather and Seesoft hip protection as its masculine counterpart, it will feature Sas-Tec CE armor at the knees and will have detachable leather knee patches in place of knee sliders. Both the GT-R and the REV'IT! 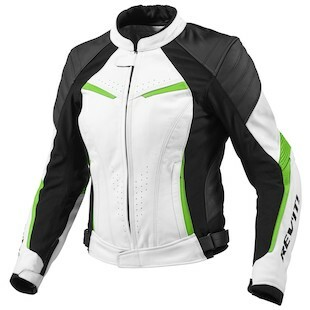 Xena Jacket will share a slim, race fit. 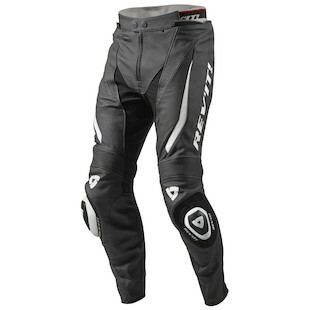 Comfort will come from stretch panels located at the legs and crotch with accordion stretch zones on the knees and back allowing the rider to move freely as they slide themselves back on forth on their bike. Cooling will be provided from ventilation panels located at the front and back of the legs. In retrospect, touring in racing leathers in the hot summer heat of the South was probably not the smartest thing I have ever done, but I was young and could not afford multiple options. The GT-R and Xena pants are ideal for someone who does a track day once or twice a year and does not want to spend the money on a full one-piece race suit. In addition to track use, they are perfect for anyone looking for added protection on those more aggressive weekend rides when the road gets curvy. My only recommendation is to avoid using them while touring Texas in July; we have better options for that.